In antiquity in the area near the river Sawing Padamara live a poor family . The wife called Inaq Lembain and her husband named Amaq Lembain .Their livelihoods are agricultural laborers . Every day they walk to the village for the village offers strength to pound rice .If Inaq Lembain pound rice then her two children came anyway . One day , he was busy pounding rice . Both children placed on a flat rock near where he worked . Surprisingly , when Inaq started mashing , where they sat stone increasingly ascending . Feel like removed , then his eldest son started calling his mother : " Mom is getting high rock . " But unfortunately Inaq Lembain was busy working . Replied , " My son wait a minute , Mum just mashing . " That happened repeatedly . The flat rock increasingly grow to exceed the coconut tree . The two children were later yelling uncontrollably . 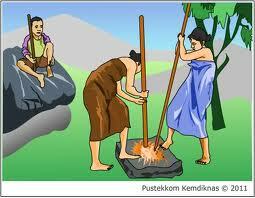 However , Inaq Lembain keep busy pounding and winnowing rice . The kids sound more and more faint . Finally the voice was not heard from again . Goloq rock it higher and higher . Bring up two children reaches the clouds . They were crying uncontrollably . Only then Inaq Lembain realized , that the two children were already there . They were taken up by Stone Goloq . Inaq Lembain sobbed . He then prayed to be able to take his son . Syahdan prayer was answered . He was given supernatural powers . with his belt he will be able to cut the stone Goloq . Magically , the stone was cut with belt severed into three parts . The first part falls somewhere which later was named the Village because it causes soil olrh kingpin there tremble . Part two fall in place called Dasan Stone because there are people who witnessed the fall of a fragment of this stone . And the last piece falls somewhere causing a roar . So the place was named Montong Teker.Sedangkan either was falling to earth . They have changed to two birds . Eldest son turned into a bird Kekuwo and sister turned into a bird Kelik . Therefore both of human origin , the two birds was not able to incubate their eggs .